AIA Geospatial Interest Group | The Geospatial Studies Interest Group consists of AIA members with an interest in geospatial applications in archaeology, and in promoting its understanding to members of the AIA through its various programs and publications. 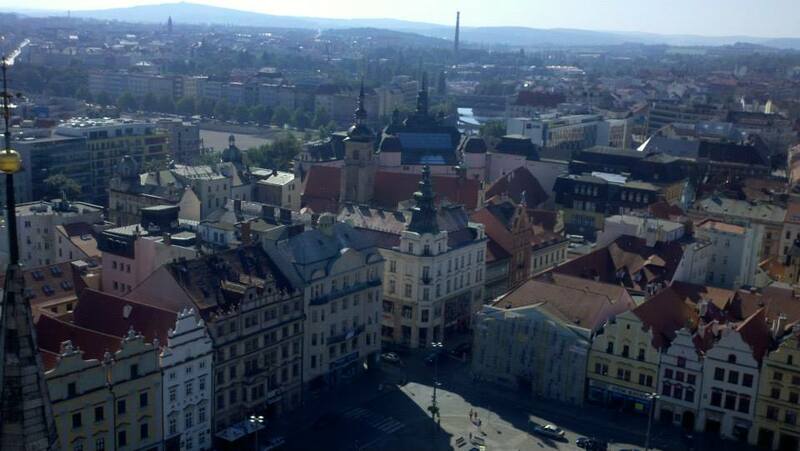 In September, the European Association of Archaeologists (EAA) held its meetings in Pilsen, Czech Republic. I attended this meeting, and participated in a roundtable on ‘Ephemeral Landscapes,’ organized by Martijn vanLeusen, Andrew Bevan, Kayt Armstrong, and Wieke deNeef. The workshop was well attended, and a lively discussion was held on the state of landscape archaeology and geospatial applications. As we are on the cusp of the AIA meetings in Chicago, I present my thoughts and general takeaways. These are my own ideas/impressions and I am not representing anyone but myself in these thoughts. During and after, there was quite a bit of discussion between the audience and speakers, bringing out several themes in my mind. Some of these I see as providing interesting and fruitful areas for concerted attention, others are time-worn issues that seem in no real way currently solvable (if they even need solving). Data interoperability. Work from the Upper Thames brought this point to light. In this region, Thomas noted the wide variety of projects and studies, initiated over a span of decades, and the complexity that arises from the perspective of data mining. It is in no way an isolated case. Developing systems for integrating divergent studies is an imperative – especially for areas where there is intensive activity from multiple entities. The conversation moved into discussing ways in which methods could be streamlined. On one level, this is a valid discussion. On another, I feel the need for caution. If we focus excessively on streamlining methods, we enter into a morass where people start championing specific approaches and run the risk of stifling innovation in method and the exploration of new avenues of investigation. Another point against methodological standardization is the fact that this is a field of already tremendously deep datasets – how would earlier projects be integrated? Rather, systems of integration should be pursued that are able to lay over individualistic approaches. Geospatial applications, with their capacity to statistically smooth divergent datasets, may be an area where these systems can be best developed. As opposed to thinking of methods standardization that could run the risk of standardizing research questions and ignoring local needs (whether dependent upon terrain, material, or legal strictures), I would suggest looking towards the idea of data standardization. The issue then becomes a matter of statistical standardization, a matter that is not unique to archaeology, and for which there may be solutions residing in other disciplines such as biology, geology, sociology, to name a few. Ethnographic and historical analogs. The use of historical or ethnographic analogy was often addressed in the papers (Menchelli, Newhard) and within the ensuing discussion. The overriding consensus appeared that analogs should not be used as strict proxies, but rather as guides for developing further questions, and possibly tipping the balance towards one interpretation over another (barring other evidence to the contrary). Greater rigor in assigning functional attributes. In this area, we are starting to see some movement. There are beginnings of stating some criteria, and then assigning function based upon those stated criteria. We’ve been doing this for some time, but the definitions have been very generalized (it’s a biggish spread of pottery, must have been a farm house…). The capacity to integrate geospatial elements is yielding new developments in making these criteria more complex and explicit. We’re moving from a practice of inductiveness to deductiveness, which should yield opportunities in the future for stronger systems of data collection and analysis. We need not concern ourselves with offering explanations for every observed piece of antique detritus, but be intent upon describing and assigning function to as much as possible, with an explicit argument stated for those assignments. Lack of theoretical approaches. Within the presentations – and even continuing into the discussions – there was a general lack of theoretical paradigms. Despite this, there was in the air scents of several broad approaches. Speaking generally, there was a close cultural historical approach (Tiber), the more positivistic/quantitative approach (Spain, Calabria, Antikythera), and more reflexive, open perspective (Turkey- although still highly positivistic/quantitative). Phenomenological contexts appeared least represented, although such approaches would have been possible. Although theory and method cannot be separated, in my opinion, the subject of the workshop was methodologically focused, leading to a lessened focus upon theoretical approaches. Geospatial applications. Underlying most, if not all, of these issues is the need for an extensive application of GIS and other spatial applications. Data interoperability and functional modeling, in particular, are issues where intensive use of geospatial applications are inherently required, and should be included within the basic toolkit of any person involved in the practice of landscape archaeology. Overall, I view efforts to consolidate methods to be a red herring that would move us away from more effective contributions. A sense of best practices have generally been in place since the days of Plog, Plog, and Wait (if not earlier), and what we should be encouraged is refinement and development of technological tools and analytical techniques that build upon the general methods of the past. Areas of growth reside in the areas of data interoperability and developing/encouraging systems that seek to describe and explain archaeological signatures in a structured and systemic fashion, with an eye towards allowing a variety of theoretical approaches to be brought to bear on the data. This is the eleventh in a series of posts exploring 3D modeling in Mediterranean and European archaeology. For more in this series click here. We hope these papers will start a discussion either in the comments of the blog or on Twitter using the #3DMedArch hashtag. In the beginning of the 16th century up until the Thirty Years War, the city of Lemgo was turned into a Renaissance fortress with a rampart, trench and bastions – unfortunately it was never finished. The southern entrance to the city was a bastion bathed by the river Bega with an associated gate construction with rampart and outer bailey on the city side (fig. 1). This is the tenth in a series of posts exploring 3D modeling in Mediterranean and European archaeology. For more in this series click here. We hope these papers will start a discussion either in the comments of the blog or on Twitter using the #3DMedArch hashtag. I’m very glad that Bill has run this series of 3D Thursday blog posts, because they have demonstrated with particular clarity that field archaeology is at a turning-point in its engagement with three-dimensional visualization. A decade ago, a series of posts on 3D technologies in archaeology would have been concerned mainly with computer-aided virtual reconstructions and immersive environments or with the use of laser scanners. This series, however, has highlighted an emerging common interest in the use of computational photography to create photorealistic 3D representations of archaeological material. I’m not sure when this went up on the internet, but no one has pointed it out to me before, and so therefore I offer you the following post. I just discovered that the Acropolis Museum in Athens is featured in the Google Cultural Institute (a division of Google of which I was hitherto unaware), and it has a page where there is featured selection of various artefacts in its holding, so details of the gods on the East Parthenon Frieze, the Antenor Kore, the Moschophoros, various decrees, and so forth. That is all fun and good, but if you click on the little yellow man by the words Acropolis Museum you can actually view the inside the museum in Google Maps with 360º rotating views, including a full walkabout of the Parthenon frieze and the gallery of sculpture on the first floor. This is the ninth in a series of posts exploring 3D modeling in Mediterranean and European archaeology. For more in this series click here. We hope these papers will start a discussion either in the comments of the blog or on Twitter using the #3DMedArch hashtag. This is the eighth in a series of posts exploring 3D modeling in Mediterranean and European archaeology. For more on this project click here. We hope these papers will start a discussion either in the comments of the blog or on Twitter using the #3DMedArch hashtag. I come to the topic of 3D imagery from the perspective largely of the ‘end user.’ While I’m involved with projects that are capturing and using 3D imagery (such as the Palace of Nestor Linear B project), my expertise does not lie in this area. As such, my perspective and contributions lie on the level of one who sees 3D imagery largely in the context of its use, and in the broader context of digital applications in archaeology.